Slate had an article this week about sous vide. They think everybody will be buying a $300 sous vide circulator any minute now. About a year ago they had another article saying sous vide was not going to catch on, all you need is a microwave and a rice cooker. I second that. As a small-houser I have no range. I depend on countertop appliances for all my cooking. Microwave, rice cooker, toaster, and Mr. Induction (my hot plate) are all I use to cook in the house. I discovered a new use for my rice cooker this spring. I took pictures of it but never got around to blogging it until Slate reminded me. 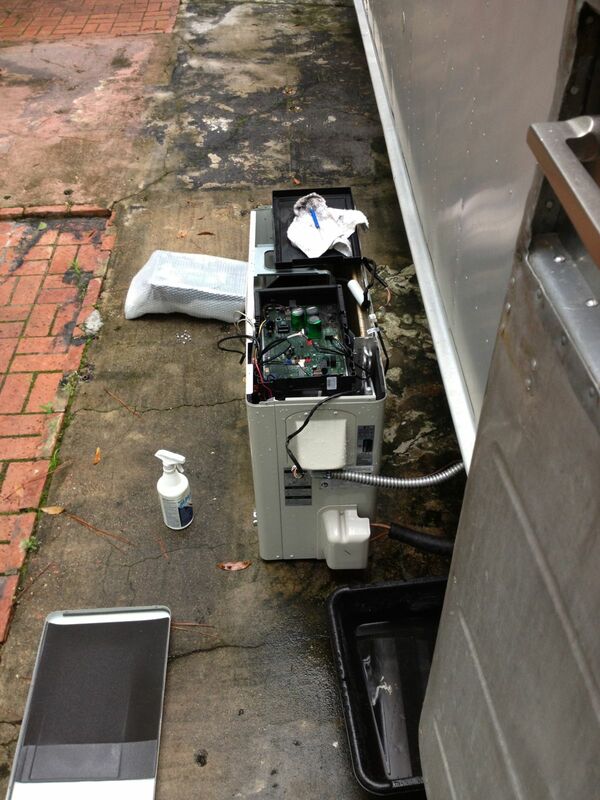 I have a friend in Austin who made his own sous vide set up with some electronic controls and a roasting oven. I already have something that very carefully maintains a steady temperature, my fuzzy logic rice cooker. 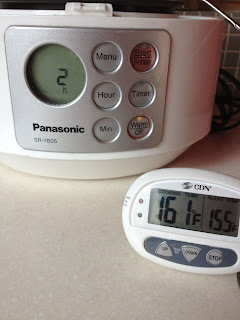 It will keep rice delicious for 13 hours. I put some water in it and set it to Keep Warm to see what temperature it holds. About 160°F. That's too hot to sous vide beef and messes up the elusive perfect sous vide egg. (I tried it. Just hard boiled it.) It is a fine chicken temperature though. 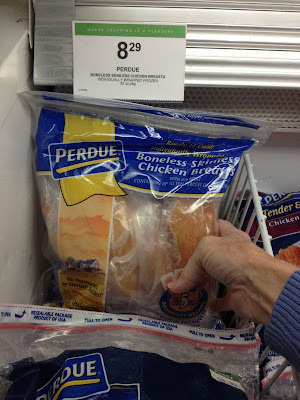 I have cooked whole cornish game hens in the rice cooker before, but not vacuum sealed. I just put the raw chicken on top of rice with the right amount of rice water, set it to rice cooker, and the chicken was done about an hour after the rice time ended. The Keep Warm finished it. My friend who cooks sous vide a lot had a vacuum sealer already when he built the warmer. I don't have room for any more stuff in my tiny house. I'm not getting a vacuum sealer. But then I noticed these at the grocery store. Kind of expensive for me. 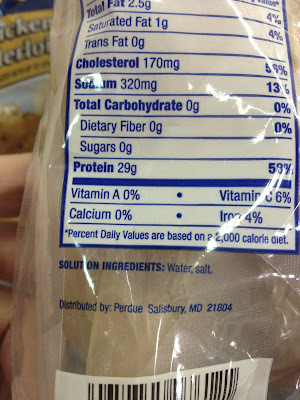 $8.29 for 32 oz is over $4/lb. I consider that outrageously high. 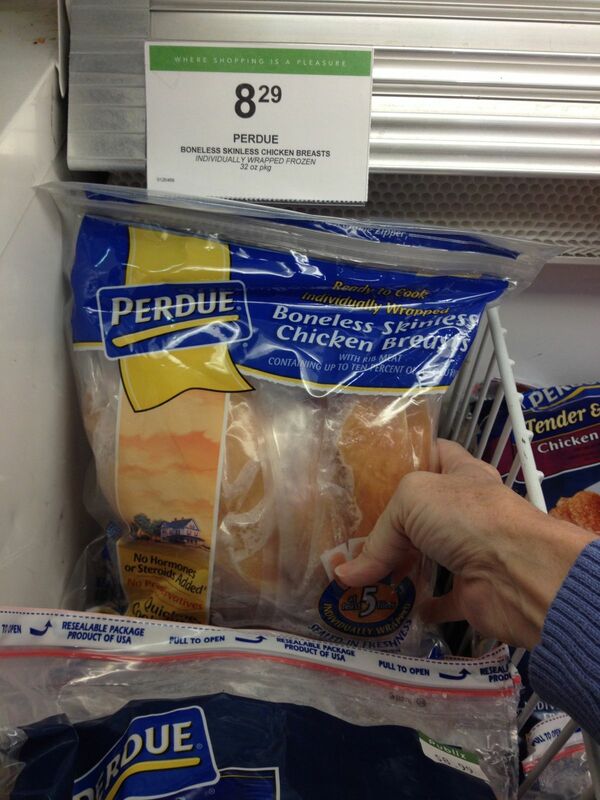 I only buy meat if it's under $1.99/lb. (Therefore I don't eat a lot of meat.) But if these individually wrapped ones are on sale I'll get them because they keep so well. My first attempt I thawed one out, put it in the rice cooker with tap water to come up to the 3 cup mark (full on my rice cooker), and turned it on to Keep Warm. I kept checking for it to get up to 160° then I let it go an hour. It took longer than I thought it would to come up to temperature. I think I may have overcooked this one. This is what you do with a kind of unappealing white slab of salty chicken – make a sandwich. 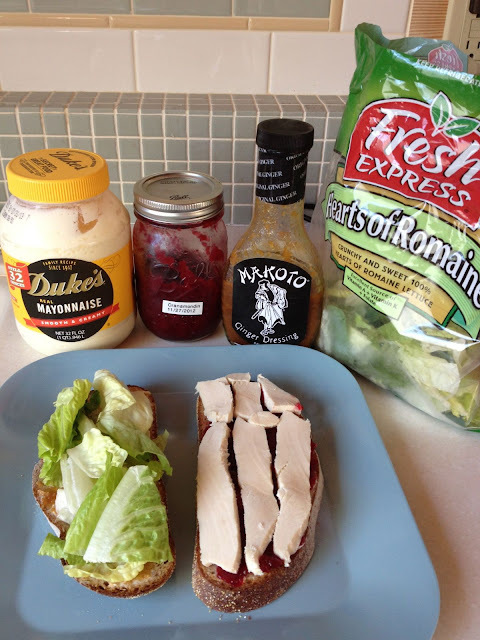 This is my favorite sandwich, whole wheat bread with mayonnaise and homemade cranberry/calamondin (cranamondin) sauce one one side, topped with sliced sous vide chicken. The other side gets mayonnaise and ginger dressing topped with romaine lettuce. Whole romaine leaves are my favorite, but I didn't have that when I made this picture sandwich. (Romaine lettuce lasts for weeks in my refrigerator. It is the friend of the hermit.) I like to stretch my food out so I only use half a chicken breast for a sandwich, then I can have another one the next day. 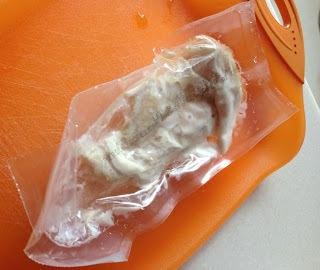 Place frozen, individually wrapped chicken breast in the rice cooker pan. 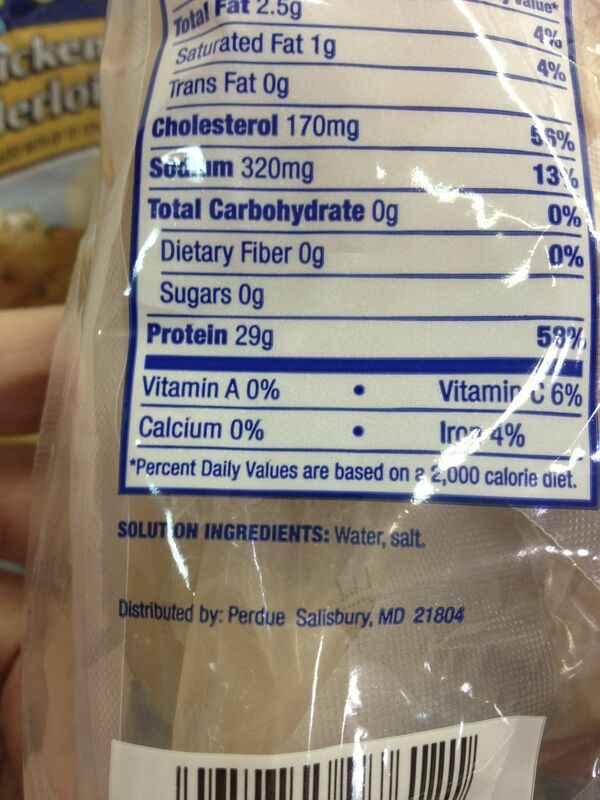 Boil 2 cups of water in the microwave and pour it over the chicken. This usually softens it enough to slump down and fit in the container. Close the lid and push the Warm button. About an hour later chicken is ready. Get it out of the hot water with tongs, peel away the wrapper, slice to eat immediately or refrigerate whole for cold sandwiches. 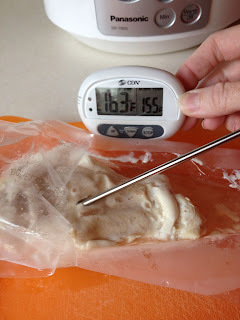 For 2 chicken breasts extend time to an hour and a half. Starting with hot water is the key. It's too hot, but the chicken is too cold. About the time they equalize the machine is keeping it all at 160°F. In slightly more than the 2 minutes it takes water to boil in the microwave you are done cooking and are back to doing something else. I like the rice cooker because it's totally OK to just walk off. It's not going to burn the house down if I go work in the office. The worst that will happen is I forget to go get the chicken out and it gets dry around 2 hours. I set an alarm on my phone usually. I've also done two frozen breasts at a time, with the boiling water to start. I think I went about an hour and a half. They were the juiciest and most succulent. I unwrapped it immediately and refrigerated it. I served a sandwich like this to a friend who remarked that it was really good. So it's not just me, I have TWO data points. I got a new air conditioner for my Spartan project in March of 2013. 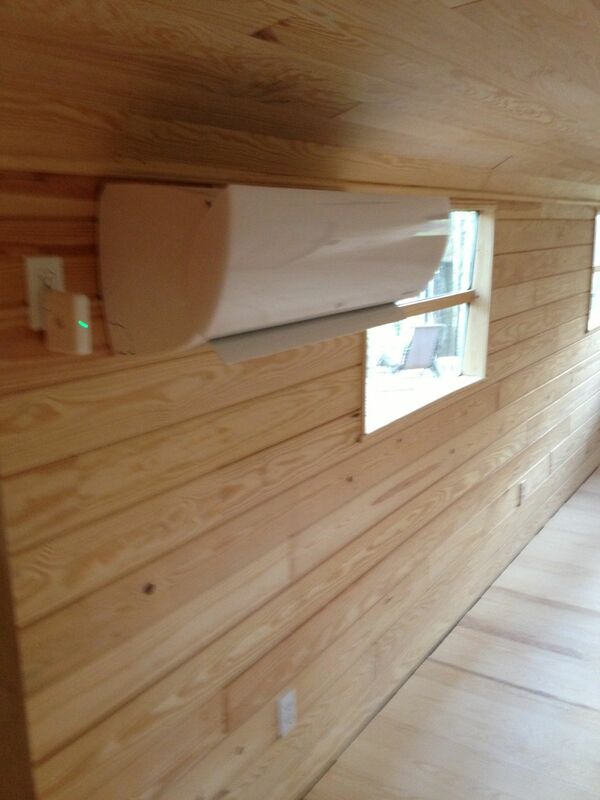 It's the latest LG Mini-Split with a DC motor on the fan and compressor (I think). 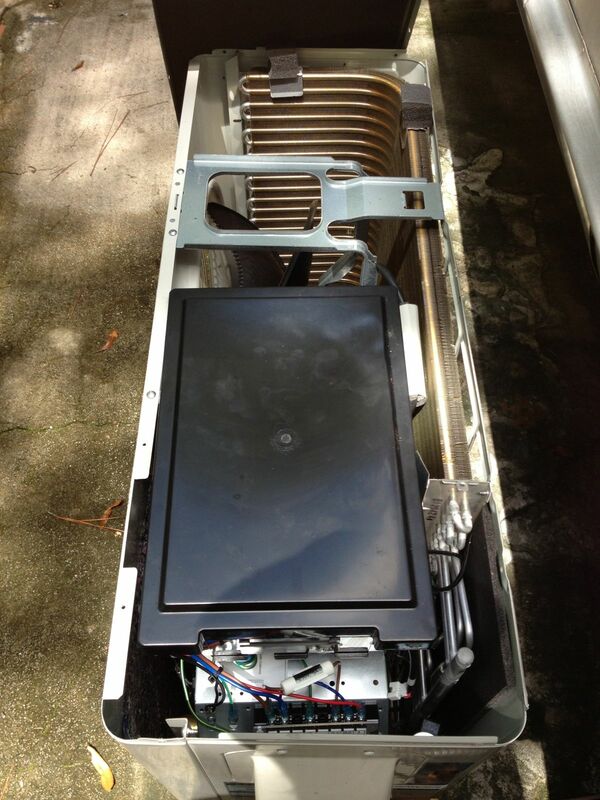 It delivers AC power to the inside unit. 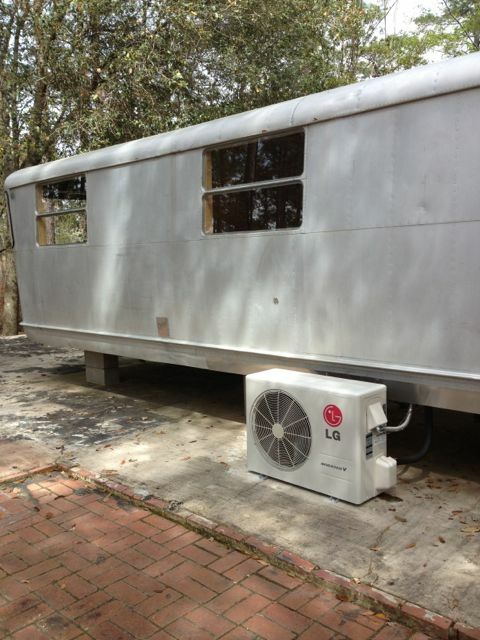 The idea of the inverter is to use the minimum amount of energy required to do the job. Instead of full blast or off, there are degrees in between determined by varying the DC voltage applied to the motor. So inside there is a big ol' power supply built on a circuit board, similar to the one for a computer, only bigger. It generates it's own heat, which I guess is calculated to still be less than what is wasted by running everything full blast all the time. 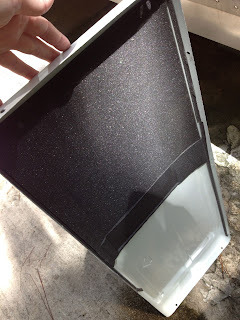 My air conditioner works great for what is basically a solar oven. I thought I would put up shade sails because they would look neat and keep the sun off when the tree shade is lacking in the middle of the day. Turns out the cost of them and the trouble to take them down for every hurricane warning seemed more than just paying for extra electricity to run the new air conditioner. Of course nothing is perfect, not here in the Deep South where nature lives to challenge engineering creativity. On July 3 my air conditioner didn't work. The inside unit just flashed C-05 on the display that usually shows the temperature. I Googled that and found that it means communications error. Standard fix is a new communications board in the outdoor unit. I went out there and put my nose up to the place where the wire goes from inside to outside. I could tell by the smell that somewhere the smoke hath poured out from within. (This expression may be unique to me. There was a computer on the floor in the lab at my old work that had a post-it note on it that said "Smoke poureth out from within," which I thought was a very classy and precise way to say it was broken.) But I digress. I called the company that installed the air conditioner to see if the warranty covered labor. Yep. They would send the technician right out. 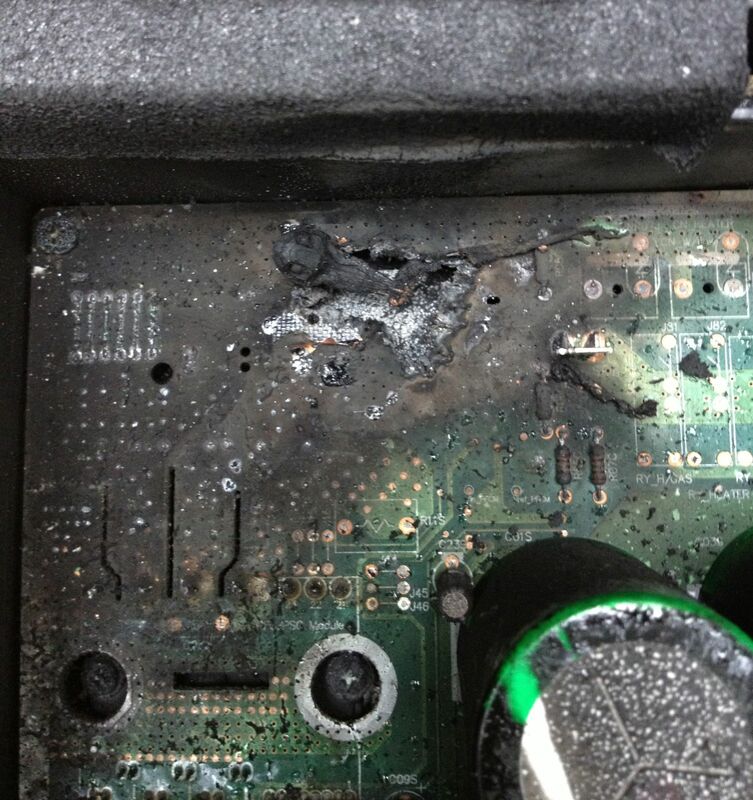 The technician quickly identified that I did indeed need a new control board. This one had catastrophically failed as a result of incinerating a tree frog. Tree frogs would seem to be pretty conductive, all clammy and capable of really good contact. Whenever I pick up a tree frog it reminds me of shaking hands with a sweaty baby. There were two dead frogs on the control board, but I think the first one caused the failure and took the other one out with him. 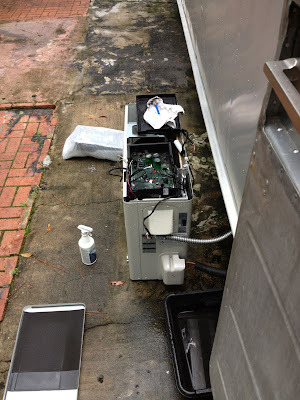 The technician came back on July 12 with a replacement printed circuit board (PCB) assembly. The man at the office said he didn't tell LG about the frogs when they ordered it, but they do have to send the burned up one back. I am not confident they will remove the dead frogs. I feel pretty bad for whoever works in receiving at the end of that trip. Here's a close up of the place where the frog shorted out the high voltage DC connector tab to the chassis ground trace running around the board. My friend Cheryl says PCBs start to get soft from 150 - 170°F. Chicken is done at 160°F, so extreme charring like this requires much more than that. 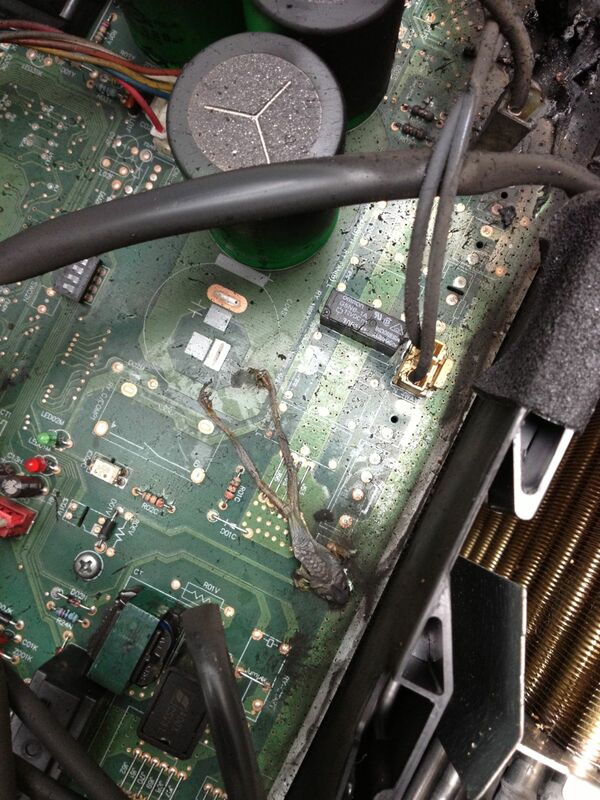 So no wonder the circuit board is just completely gone under the frog. That's a giant aluminum heat sink underneath him. Which is why he was there. Sybarritic softie wants a place to hang out warmer than 77°F, the low here for the last few weeks. Cheryl also told me the proper term for a hole in a circuit board from an arcing frog is "thermal event," not "smoke poureth out from within." Incidentally, PCBs are epoxy impregnated fiberglass, so that distinct smell is probably from the sooty remains of epoxy resin. Here's the same part of the new circuit board. 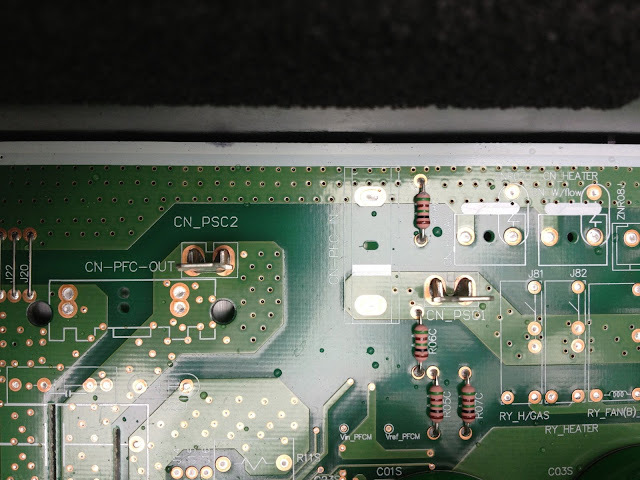 The part the arc obliterated is that blank board area between the tab labeled CN_PSC2 and ground, that band of copper and vias running around the outside of the board. There was no plane of copper under the frog to dissipate the heat. It just burned right up quickly. I guess the arc extinguished itself when the frog was exploded enough to open the circuit. 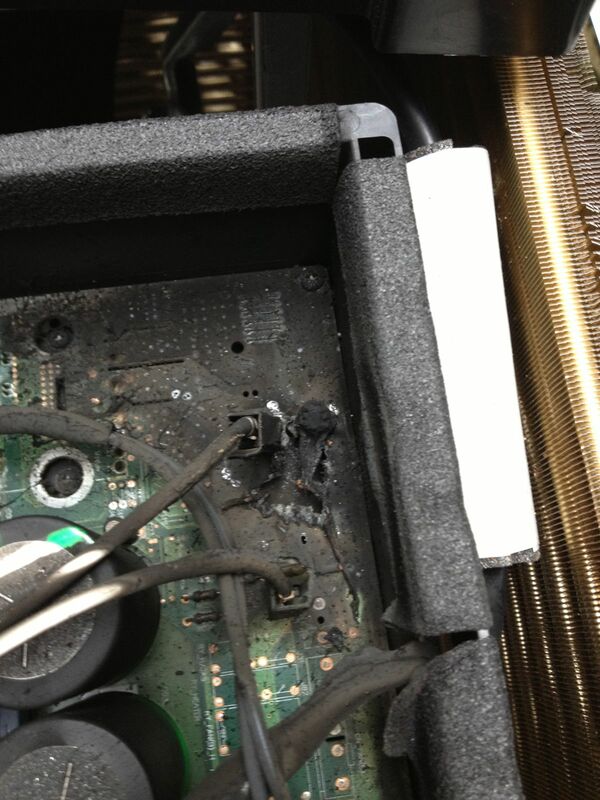 None of the 2 fuses in the system were affected. The technician got the replacement in place and tested it. Then he went away and I immediately turned it off for fear another frog would get in it. I wanted to make modifications that could be proven over the rest of the year, before the warranty runs out. I think rather than try to keep frogs from going into the air conditioner generally I should just try to keep them out of this black plastic box. If I tried to build a cage of mosquito size screening around the whole unit, as suggested on Google+, it would need to be enormous to allow the kind of air flow required by the unit. I'm going to try to block up the holes where the wires come in with this 3/8" backer rod. This is a foam that's intended to back up caulk joints. It costs about $4 for this package of way more than I need. I wasn't sure if it would work best vertical or horizontal. I did some of both. I can go look at it again after a few months of use and see if any fell out. 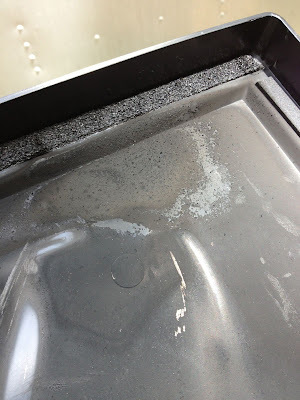 The lid is warped and sooty from the thermal event. Glad it didn't get hot enough to start it on fire. 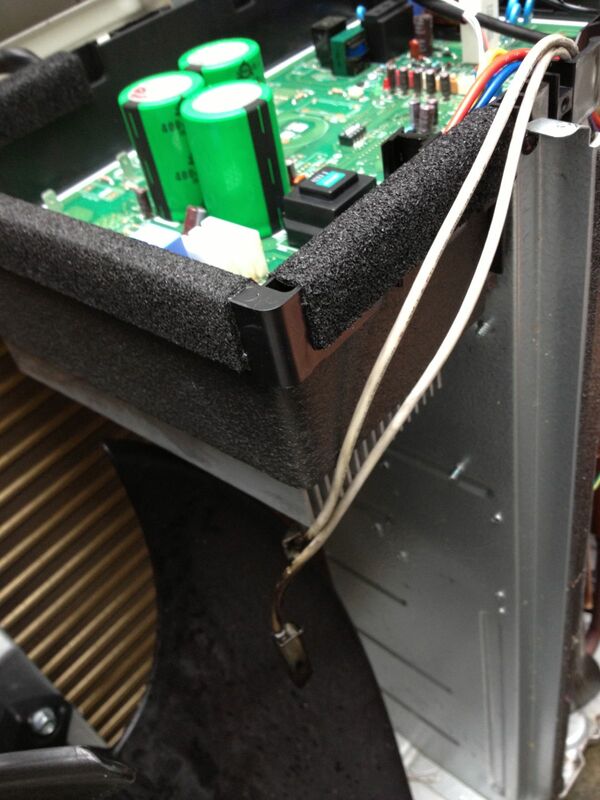 The cover for the unit has foam on the end over the control board. I hope this means no frogs can get in there and muscle their way in by bumping the top off the enclosure. The plastic lid doesn't really snap on or anything. Just sits there. The metal cover is screwed down. I put the top back on and fired up the indoor unit and cooled down my Spartan. And dehumidified it. The floor boards were starting to swell so much they cracked when I walked around. So that's how I frog-proofed my LG inverter air conditioner. I will update this if these countermeasures fail. What if it depended on that air flow around those wires and it overheats, even with that big aluminum heat sink underneath it? I am worried it really isn't a great design for sitting in the sun on the south side of a building where temperatures routinely top 100°F. My other LG mini-split air conditioner is underneath my house, out of the sun, and with no inverter. I've never had a single problem with it in 8 years. But this one, even with openings around the wire for air flow it has to get hot in there. Is it a good idea for the plastic lid to be pressed up against that metal top? Easy maintenance, it's true. But that's just regular closed cell foam on there, not aerogel. I bet it gets at least as hot as in my car where I've measured temps of 150°F. (I've made peanut butter cookies on the dash before.) 150°F is the temperature the circuit board material starts to get soft. I'm about to put it through a hard environmental test the next few months. I guess I'll find out soon if it's fit for long term service in the Deep South.